St Michael le Pole, between Chancery Lane and Ship Street, “St Michael of the Pool” overlooked the “Black Pool” from which Dubhlinn took its name. The round tower stood for almost 700 years before it was removed. Illustration by Beranger from the early 18th century, but a later illustration from the 1750s exists. 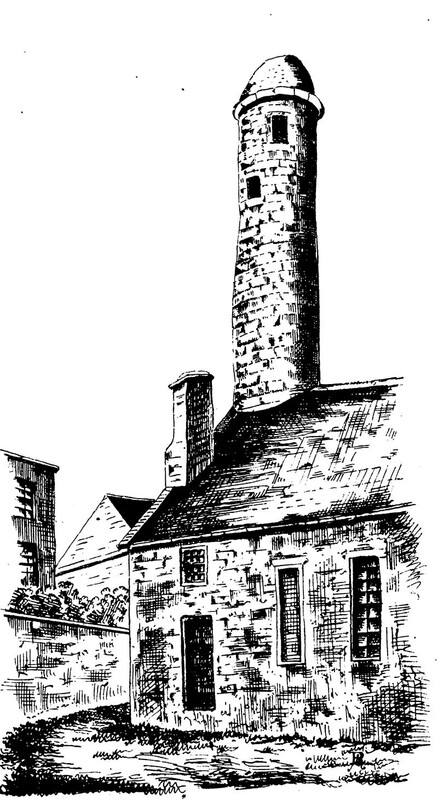 “The round tower which adjoined the church was taken down in 1778, but some fragments of it remained as late as 1782. It was originally about 90 feet high, but in the great storm of 1775 (November) it was so much shaken that many of the stones fell out, and the centre became what is termed ‘bulged,’ which rendered it dangerous to the schoolhouse and to the neighbouring houses. 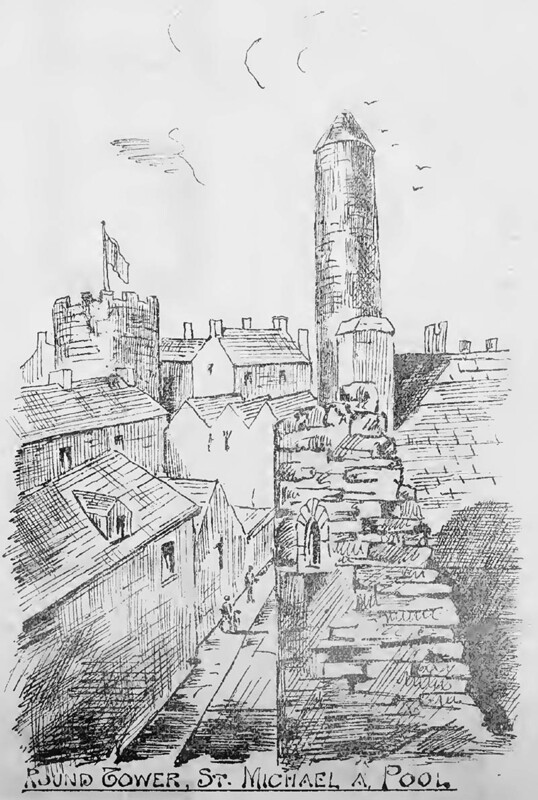 The state of the tower was submitted for the consideration of the dean and chapter of St. Patrick’s Cathedral, as patrons of the church, the parish having been united to that of St. Bride’s in 1682. The dean and chapter consulted skilful architects, who reported, on close examination of the tower, that it could not be repaired, as any attempt to repair it, by erecting scaffoiding, &c’, would inevitably pull down the building. It appears that about the year 1738 an eminent antiquarian had applied to the Dean and Chapter for contributions to repair the tower, and that it was then scaffolded from the ground, and well pointed with stone and mortar, both within and without. These seasonable repairs preserved it for a time, but the effects of the storm of November, 1775, were irreparable.